Catching ‘em all isn’t always easy, and that’s where PokéCoins can help. PokéCoins are Pokémon Go’s in-game currency, used for purchasing consumable items and cosmetic wearables in the Shop. There are two ways to obtain PokéCoins in Pokémon Go: by successfully defending in a Gym and by purchasing them with real-world money. Most items which can be purchased using PokéCoins can also be obtained through PokéStops, so purchasing items with PokéCoins is really only necessary if you don’t have access to many PokéStops, or if you want costly items and simply don’t want to wait. The only way to obtain PokéCoins without paying is by having one of your Pokémon successfully defend in a Gym. You can place Pokémon on defense in a Gym by successfully defeating all of the controlling Team’s Pokémon. Each Gym has slots for six defending Pokémon, and only one of each species can be placed on defense, so you may wish to make sure you have a good assortment of potential defenders to choose from. You’ll earn 1 PokéCoin for every 10 minutes your Pokémon defends, up to a maximum of 50 PokéCoins per day. Your Pokémon must spend at least 10 minutes in a Gym before you’ll be able to receive any PokéCoins. You can place Pokémon in up to 20 Gyms per day, but you won’t be able to earn more than the daily max PokéCoins for defending. You’ll receive the PokéCoins when your Pokémon returns to you, whether by having its Motivation depleted or being manually removed from the Gym. While on defense, your Pokémon doesn’t actually have to participate in battles. You’ll earn PokéCoins just by having your Pokémon available to defend. Pokémon are battled by challengers in the order they were placed in the Gym. The longer your Pokémon is defending, it becomes increasingly likely that its Motivation will be depleted and it will return to you, rewarding you with earned PokéCoins. Trainers can increase the Motivation of their Team’s defending Pokémon by feeding them Berries. You can earn a total of 350 PokéCoins per week by defending in Gyms. At this time, defending is the only way to earn PokéCoins in the game without spending money. If a Pokémon is returned to you before you’ve earned your daily cap of PokéCoins, you can place another (or the same) Pokémon in that Gym (or a different Gym) to continue earning towards the cap. It’s extremely important to note that you will only ever earn up to 50 PokéCoins per day, regardless of how long your Pokémon were defending. Therefore, even if your Blissey has been defending a Gym for a solid three days straight before getting sent home, it will still only return with 50 PokéCoins total, not 50 PokéCoins for each day. Additionally, if you have three other Pokémon return on the same day after their own tours, you’ll still earn only 50 PokéCoins total, so their efforts are essentially wasted when it comes to earning PokéCoins. 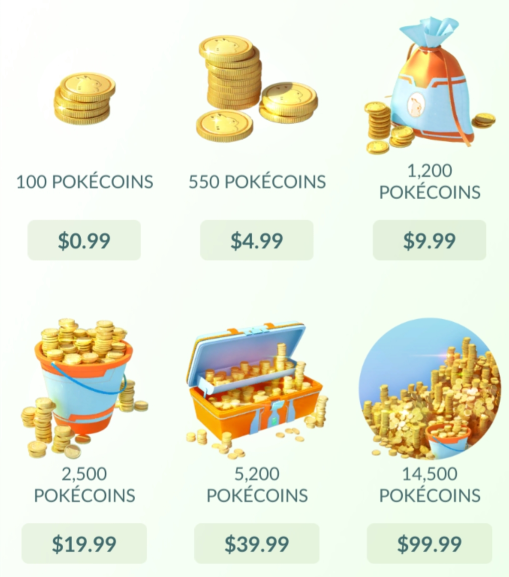 As with any mobile game currency, you can also opt to purchase PokéCoins using real-world money. The more PokéCoins you buy at once, the lower the price per coin. We’ve included the amount of “extra” coins you’ll receive by purchasing the larger bundles, beyond a $.01 = 1 PokéCoin exchange rate. Many of the items purchasable with PokéCoins can also be obtained by spinning PokéStops. There are a handful of items that you won’t be able to get your hands on without spending the currency, such as Star Pieces, however. The Shop also features boxes which include exclusive items obtainable only through purchase of said boxes. There are no randomized “loot boxes” in Pokémon Go—you’re able to clearly see what you’ll obtain in each box. Shop items are sometimes discounted during special events, but such discounts are relatively few and far between. It’s also worth noting that the only way to increase your backpack space and Pokémon storage capacity is by spending PokéCoins. The only way to expand your backpack size and Pokemon storage capacity is by purchasing these upgrades. 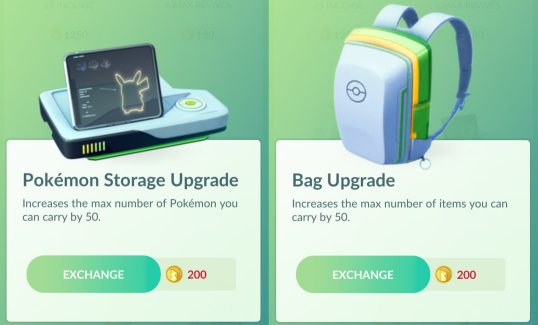 You can expand the size of your backpack by 50 for each upgrade purchased, up to a maximum of 2000 slots. Pokémon storage also maxes out at 2000 slots, though upgrades to this storage are purchased separately. You can check out all of the Trainer avatar items by visiting the "Style Shop," accessible from the main Shop. There are different cosmetic options depending on your Trainer's gender, and some require you to earn specific medals in order to be able to purchase. Such items are marked with an asterisk in the lists below. Certain avatar items can only be purchased after obtaining specific medals, earned for reaching gameplay milestones. You’ll still have to spend PokéCoins to get these items once unlocked.